The instructions for the prayer activities are simple and easy to follow, and most activities need minimal resources, which is fab. 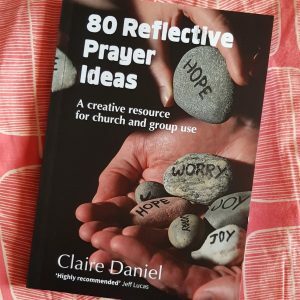 If you’re a church leader or childrens’ worker or anyone who plans times of prayer for a group of people, the ideas on this book are simple and easy to do, and with a little preparation, you could create take-home versions to inspire family prayer at home. I didn’t feel the activities were age-limited, which is great, as it means they could be used in a toddler group or an all-age service, giving everyone a way of connecting with God in a creative way. At first, I was disappointed the strapline didn’t mention families, but the activities are all written for those organising prayer times for a group, and it’s hard to make the text work for people doing things in a family and a group (I’ve tried!). If I was planning to make take-home packs, I’d be tempted to shorten the instruction text, maybe picking one or two of the suggestions for reflection to make it quicker to read and get on to actually praying. I find families tend to have less time to read instructions, and things which are ‘good to go’ are best. As I said above, it’s a shame there’s no pictures, especially as the author says she’s used lots of the activities herself. It would be fab to have a colour photo of each activity, but that would be a pricey book I guess.